Everybody has seen pendulums of one type or another. 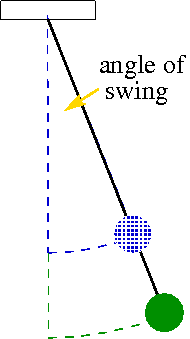 Pendulums lurk everywhere, often in disguised form, but the basic pendulum (as shown on the right) is simple to describe. You can make one by taking a piece of string and tying something heavy to it — the main thing is that the object be heavier than the string, and preferably it should be compact so that it doesn’t spin around too much. The mass on the end is called a bob (which you can feel free to call Bobby or Bobbi or even Roberta if you’re feeling formal). Let’s look at the pendulum through Galileo’s eyes: according to his own account, he was in the church in Pisa and noticed a lamp swinging back and forth overhead. He observed that the lamp repeated the same pattern of swing — it always followed the same arc, which is the dashed blue line on the figure. Using his pulse to time the swing, he determined that the amount of time for the pendulum to trace the arc was the same on each swing. This is called the period of oscillation. 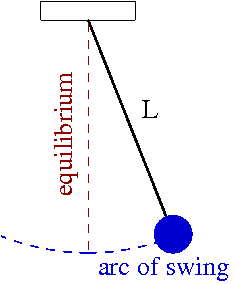 If left alone, the pendulum will sit so that its string is perfectly vertical; that position is called equilibrium, which is the position at which the forces acting on the bob are perfectly balanced. Galileo made another intuitive leap that turns out to be approximately true, but not exactly so: he surmised that the length of the string is only thing that determines the period. The size of the arc? Not important. The mass of the pendulum bob? Also not important. (He was right on that one: it turns out the exact mass of the bob isn’t important, as long as it’s sufficiently heavier than the string. The reason for this, believe it or not, is connected to Einstein’s general theory of relativity and something known as the equivalence principle — I’ll return to that idea later on.) A longer string will take a greater amount of time to complete one swing than a shorter string, which you can see from the second figure: it has to travel a larger distance for the same angle of swing. For those unafraid of the math, the relationship is a square root: if you want to double the period of oscillation, you need a string four times the length; to triple it, you need a string nine times longer, etc. Galileo recognized that over time the pendulum would come to a stop due to air resistance, but under ideal circumstances the pendulum would continue to swing on forever. That’s one area where Galileo excelled: extrapolating from highly non-ideal circumstances to ideal thought experiments which highlight important physical principles. We put all sorts of fancy terms on top of Galileo’s basic ideas today: conservation of energy, which (by Noether’s theorem) is another way of saying that if we look at the ideal pendulum at some much later time, it’s going to be swinging back and forth in exactly the same way. Galileo turned out to be wrong about the string length being the only factor in the period: the size of the swing does make a difference, but for small arcs, the contribution is negligible. I’ll return to this idea in a future post, in the interests of keeping things bite-sized. Finally, let’s see why the mass of the bob isn’t important. Isaac Newton defined mass as the resistance to motion: the more mass an object has, the harder it will be to get it moving if it’s at rest, or to change its direction or bring it to a stop if it’s already in motion. He also recognized that the larger the mass, the greater the gravitational attraction that object will possess. But here’s the interesting part: there’s no inherent reason these two qualities of an object should be the same! The amount of gravitational attraction an object exerts doesn’t have to be directly correlated to amount of resistance it gives when pushed. Contrast this with electricity: a proton and an electron have exactly the same magnitude of electric charge (one is positive and the other is negative, but the size of their charge is the same), but a proton is roughly 10,000 times more massive. If you put a proton and an electron into the same electric field, the size of the force acting on them — determined by the size of the charge — will be the same, but the proton will respond far more slowly because of its greater mass. For gravitation, the “charge” is precisely its mass. Einstein called this the equivalence principle, and when you carry the idea to its logical extreme, it leads to his general theory of relativity. For our humble pendulum, the equivalence principle just implies that the resistance to motion as the bob swings back and forth is proportional to its mass, but so is the force acting on the bob due to gravity. With the same proportionality for both cause — the force — and effect, the mass drops out of the picture! When we put other forces into the system such as air resistance, we’ll see that relationship change, but the special nature of gravity that leads to phenomena like black holes sneaks into systems even as simple as a pendulum. I will follow this post up with two more specifically relating to pendulums. The first will explore how the simple pendulum of Galileo changes when we add in air resistance or let the arc of swing be large. The second will bring pendulums into the context of quantum mechanics, and how a system as basic as this can help us understand some phenomena that don’t look at all like a mass on the end of a string. I hope you will find these topics to be worthwhile reading!